Which Two Facts Are True? It's Up to You! Looking for something to get your family unplugged from their devices and engaged in some lively discussion? Indulge their love of trivia and fun facts with this unique game book of fact versus fiction. You can polish copper with ketchup. The man who invented the bulletproof vest never shot a gun. Only two of these statements are true. It's up to you and your family and friends to figure out which ones. Read all three out loud and then use your collective smarts to figure out which one is false. Warning-you might discover that truth really is stranger than fiction. The bulletproof vest was actually invented by a woman. Gotcha! About "Two Truths and a Tall Tale"
Sandy Silverthorne has illustrated more than 20 books, was a Gold Medallion finalist, and won the C.S. Lewis Children's Book Silver Award. He lives with his wife and daughter in Eugene, OR. 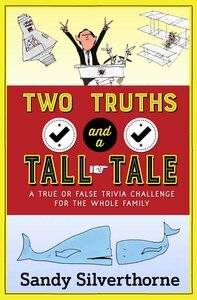 Customer Reviews For "Two Truths and a Tall Tale"
It would have been so much easier in paperback, where you could flip to the answer then go back and read the next one.